Just In! Staff level employees feel more out of the loop than ever! - Take Charge Inc.
Just In! Staff level employees feel more out of the loop than ever! 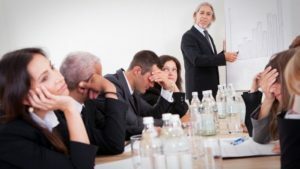 Staff level employees are 36 percent less confident than senior leaders that they are adequately trained for the future. The findings suggest a variance in how employees at different levels perceive their own influence within a company. It was reported that only 6% percent of staff level employees perceive that speaking up will make a difference. Join professional associations: network and learn everything you can about your particular field.